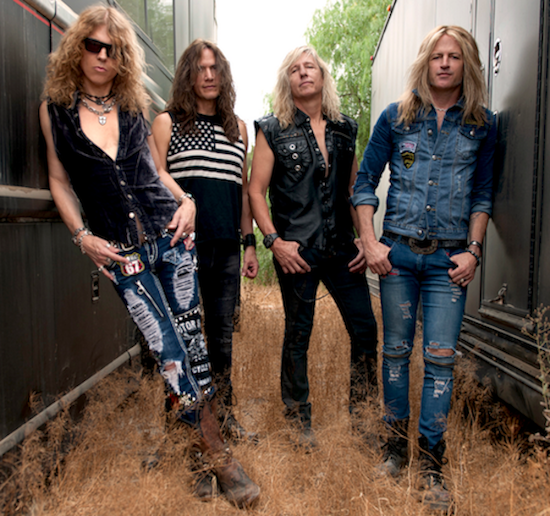 Burning Rain, the hard rock band founded by guitarist extraordinaire Doug Aldrich (Revolution Saints, The Dead Daises, Whitesnake, Dio) and vocalist Keith St. John (Montrose, Kingdome Come), will release its fourth studio album, Face The Music, on March 22 through Frontiers Music Srl. In conjunction with the album announcement, the band have shared the latest single, Midnight Train, along with an accompanying music video. When asked why the band chose to release Midnight Train as the first single, Aldrich explained, “when we were asked what song encompasses the sound of Burning Rain, Midnight Train,seemed like a good choice. It sounds fresh and heavy, but still sounds like us. Everyone will have different ideas about favorite songs and there are a number of tracks that could have been first, but we just went with Midnight Train. Burning Rain was established in 1998 by guitarist Doug Aldrich and vocalist Keith St. John. After meeting through mutual friends, Aldrich and St. John commenced work on what would eventually become their self-titled debut album. The 1999 record established Burning Rain as a hungry yet seasoned group of musicians. Although the album was limited in its release, it did receive rave reviews from fans and critics alike for their take on heavy, blues-y hard rock. The following year, Burning Rain released the follow up, Pleasure To Burn, which showed a matured Aldrich-St John collaboration that gained even higher praise than the first album. In 2001, Aldrich joined Dio and later departed in 2003 as he was approached by David Coverdale to join a newly reformed Whitesnake, while St. John joined forces with guitar legend Ronnie Montrose. While still in Whitesnake, Aldrich started working on new Burning Rain music, which saw the light of day in 2013 as the album, Epic Obsession. Their third release was again met with enthu-siams from fans and critics alike. Aldrich would later leave Whitesnake and join The Dead Daisies and Revolution Saints, which left Burning Rain on an extended hiatus. Now, finally a new album is ready for release, Face the Music, is a blues driven hard rock record which is truly a tour-de-force. With a renewed lineup featuring the amazing Blas Elias (Slaughter) on drums and bassist Brad Lang (Y&T), the album evokes the sound of the classic 70’s hard rock scene, but also stays true to the Burning Rain sound. Good song. Singer sounds like Coverdale, not a bad thing. face the music..what is this, a paul stanley tribute band? Man, Doug Aldrich is never unemployed! The guy is as busy as Lynch.